The Minister is finally taking an interest. Have a look at this 30th May media release from Local Government Minister. He's announced a Review Team to "work with" Kaipara District Council as it completes its 10 Year Plan. I understand in fact that the Minister communicated with the Council earlier in the week to the effect, "if you don't ask for our assistance you might get what you don't want....". So Council wrote asking for assistance and its got a Review Team. "Is the Government stepping in with financial support for the Council? No. The Government will only fund costs associated with the appointment of the review team. 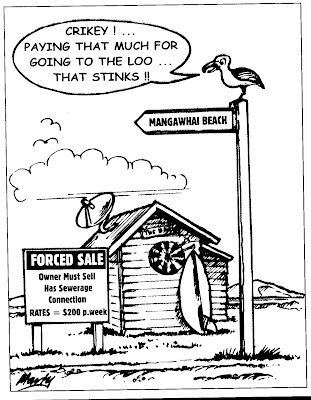 It is also important to remember that the Mangawhai scheme has already received a Crown subsidy of $5,896,107 (GST exclusive) through the Sanitary Works Subsidy Scheme administered by the Ministry of Health...."
Submissions to the KDC Team Year Plan had to be in by 30th May. Just last week. 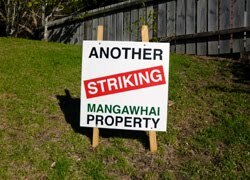 A day of hearings at Mangawhai is happening on Thursday this week 7th June. I hope to be in attendance - especially if the fishing is bad. I'm sure the Minister's Review Team will be in attendance. Councillors must be shitting themselves. Deservedly. The Ten Year Plan needs to be adopted in a couple of weeks. Word among the locals is that they want a rate strike. Signs are sprouting around the neighbourhood. Their anger is understandeable. 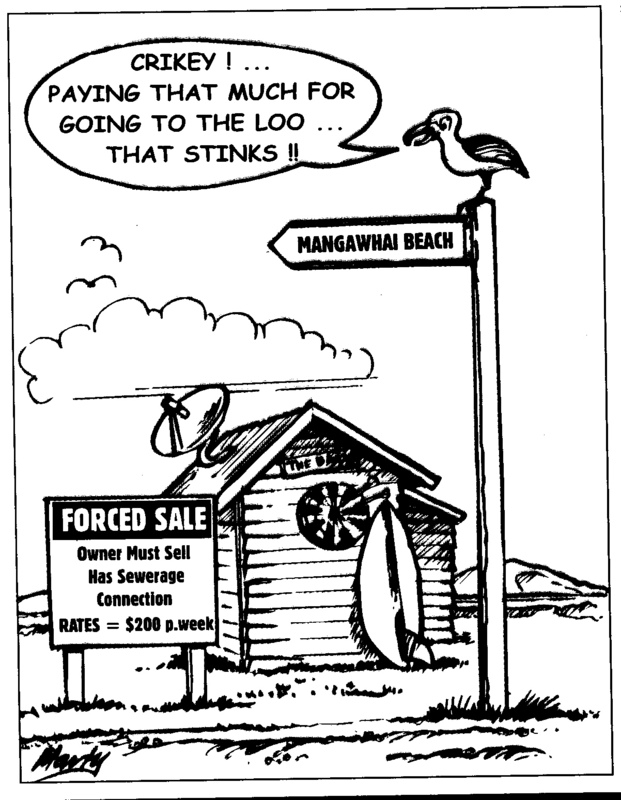 Around three years ago Kaipara District Council voted in confidential to double the size of the wastewater scheme (doubling the land area that was serviced and could be developed, and doubling Council's infrastructure investment) - without consulting ratepayers. An ultra vires decision. By definition. Residents oppose paying for a loan that was taken out by their Council illegally. You'd think that Central Government had no option but to cover costs and liabilities of an illegal Council decision.